The Famous 1938 Carnegie Hall Jazz Concert is ranked as the best album by Benny Goodman. Members who like this album also like: Chet Baker Sings by Chet Baker, Black Coffee by Peggy Lee and The Amazing Bud Powell by Bud Powell. 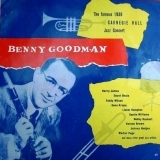 Related links: top tracks by Benny Goodmantop tracks of the 1950s, top tracks of 1950. Showing latest 5 ratings for this album. | Show all 62 ratings for this album. Related links: top albums of the 1950s, top albums of 1950. Classic recording of a classic band. Who knew the clarinet could be so cool. If you have Carnegie Hall Concert as 78rpm, vinyl or CD, you have real treasure!Milestone of the live albums; released a doubleLP in 1950, 16 years before "Blonde on Blonde"!